The amount of data that’s being created, collected, stored and protected is growing all the time. IDC predicts that the amount of data will reach 40 zettabytes by 2020 and more than 163 zettabytes a year by 2025. Increasingly, this data is becoming more valuable than ever before as businesses rely on the insights that data can provide. But storing, accessing and analyzing this data is only as good as how quickly you can do it. And where high-performance is key, LTO Technology is the right option. Tape? 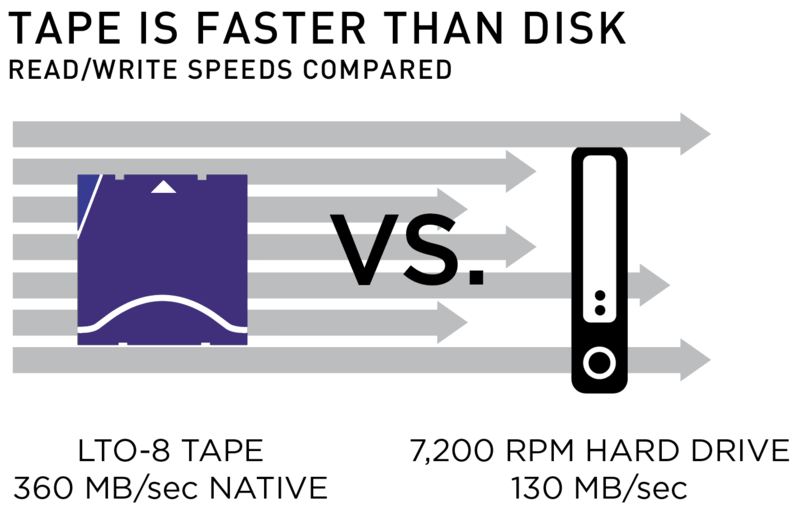 Yes, despite the common misperception that backing up to tape is slower than disk, tape delivers some of the best performance possible when comparing raw speed. In fact, it’s faster than disk. And with LTO-8 tape technology, you can enjoy read/write speeds that approach 750 MB/sec compressed. When you compare native data rates, that’s 360 MB/sec, which is faster than the typical 7,200 RPM hard drive (160 MB/sec). So next time you’re considering performance as a key aspect of your decision, know that tape provides a great option that can outperform other storage technologies available on the market.